National Day Parade (NDP) in Singapore used to be an exciting day for me. Participated in one during my secondary school days - one of the proudest and most memorable time of my life. Burning many weekends to train for the mass display under the hot sun, just for that one chance to perform live for a few minutes in front of thousands of Singaporeans in the National Stadium and many thousands more behind TV screens at home. The joy of executing it flawlessly on the actual evening made all of us incredibly proud and happy. I often wondered how does it feel to be a superstar performing in a live concert. I finally had a little taste of that when I heard the thunderous applause coming from all directions on that special 9th day in August as we executed our surprise finale move - unveiling a massive national flag above our heads and doing the human wave with it. A few years later, during my National Service, get to work with the executive committee of that year's NDP. Had a new found respect how much work and planning is involved in organising and executing one. The lessons learnt then was very helpful in my professional life. From then on, it was no longer that fun and exciting as year after year, it is just more of the same and became too predictable - the fighter jet flybys, commandos parachuting from the sky, the fireworks, ...etc. Being unlucky balloting for tickets year after year was not helping too. For some (or many?) Singaporeans now, talk of NDP will make us really excited .... about planning where to go overseas for a holiday! For stargazers, most probably it's about going overseas to observe the Perseid Meteor Shower which happens yearly around the same period! (5) Selected applicants will undergo training for the launch on National Day 2015! Personally, I think this project will have a much higher chance of success than Goal 2010. Huge kudos to local entrepreneur Marvyn Lim Seng for simply having the GUTS TO DREAM and at least giving it a TRY to make it happen in Singapore! Wishing him, his start-up and all the related organisations all the best in this endeavour! We should do a reality show about the training and final selection of the astronaut for this historic flight! 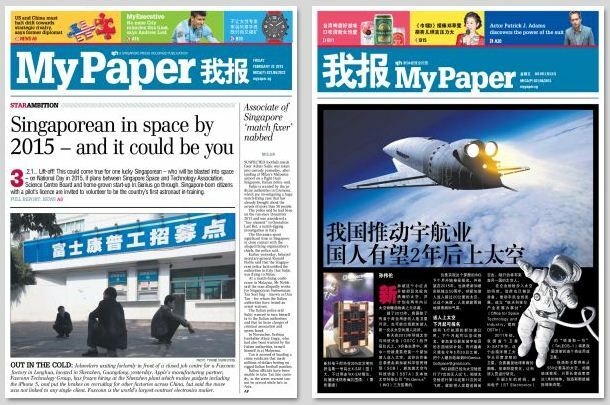 That will really get Singaporeans excited about Space and Science and its related spin-offs, e.g. space tourism, education, economy, jobs, ...etc. That is one local reality show I will not miss and I think the ratings will go through the roof. - ST Electronics to launch TeLEOS-1, the first made-in-Singapore commercial remote-sensing satellite. Minister Mr S. Iswaran mentioned this in his speech - "First, space could ignite the interest of our youths to carve out their career paths in the fields of science and engineering." Couldn't agree more. This is already a proven fact. It is call landing humans on the Moon and safely returning them back to Earth and the advancement in science, engineering and technology in the United States. There will always be short-sighted naysayers who will questioned whether the money should be spent in other areas of our society. Some of them will just criticise only the sake of criticising. These are the people we should just ignore. For those who are sincere in finding the answers to such questions with an open mind, recommend them to watch the following videos. The date is 10th August 2015. You are a teacher in Singapore. Your principal wants you to address the whole school during a public assembly to inspire the students to do well in Science and Math. But you are only given limited time to say a few words. Will you say: "If you get good grades in Science and Math, you can go to a prestigious school, then get a good job and have a good life." Or will you say: "Did you watch NDP last night? Who wants to go to Space?" Turns out it is technically not Space but in the stratosphere according to this report - Wanted: Singaporean to fly 20km above Earth. But I guess for the general public, almost double the height than all commercial airplane is "space" enough to them. The following is an excellent infographic to illustrate the different atmospheres. My next free public stargazing talk is titled "How to choose a Telescope and Binocular for Stargazing"
VENUE: Toa Payoh Public Library, Programme Zone, Level 1. Admission is FREE. No pre-registration required. Late comers are also welcomed! These are some of the most frequently asked question we encounter during our free public stargazing sessions - where to buy a telescope/binocular, how much to spend on it, what is a good one for a beginner? In this talk, I will share with you my personal experiences of how to go about finding what is the most suitable telescope/binocular *for you*. You will learn about the common pitfalls, how to avoid them, how to do research and make smart purchasing decisions that will give you the best value for your money. You will also learn that there is no such thing as a perfect telescope/binocular as each design has its own pros and cons. There will be live demonstration of telescopes and binoculars and free hands-on session so you can understand and appreciate the important astronomical concepts mentioned in the talk. *Weather permitting*, after the talk, there will be live stargazing session outside the library where you can see how different telescopes performed in actual sky condition and enjoy the wonderful views through them. You can also interact with the telescope volunteers and get some useful tips from them. On that same night, there is a rare very close conjunction of Jupiter and Moon visible in Singapore. They are so close you can cover both with your pinky fingertip held at arm's length! Both objects will fit into the same view of most telescopes and binocular. It is my sincere wish you can learn and benefit from this free talk so in return you can share the information with your family and friends who are also keen to start this hobby. Hope to see you there and let's all pray for clear skies on Monday evening! There is a very close flyby of a near-Earth asteroid this coming Saturday early morning, 16 February 2013 (Singapore time). It will be visible in Singapore if the sky is clear enough. The official name of this asteroid is 2012 DA14. Watch this video for a good introduction about this asteroid flyby. The following is an animation of the flyby. Notice Singapore is on the "correct" night time side of the Earth to view this asteroid as its closest and brightest approach. *Weather permitting*, my friends and I will be bringing our telescopes and binoculars to Bishan - Ang Mo Kio Park to observe this asteroid flyby. We will be conduct an overnight free public stargazing session on Friday 15 Feb (tomorrow evening) and stay up at least until 3:30am on Sat 16 Feb to observe this asteroid at its brightest and closest approach. Feel free to drop by and take a look through our telescopes and binocular. Please read my tweets on Twitter for the latest and most updated information. 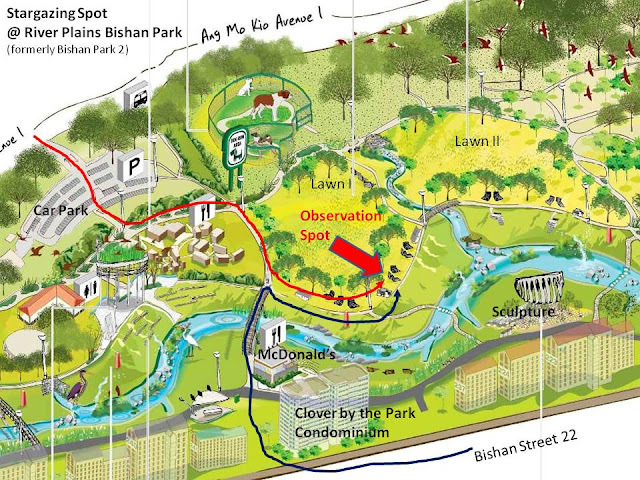 For the Friday evening public stargazing session, our location will be at open space outside McDonald's in the park. After midnight, we will be going to the opposite side of McDonald's near Grand Lawn I. How to observe this Asteroid in Singapore? - You need an obstructed dark view of the sky above (near the constellation Hydra and Leo). - This asteroid can only be seen through telescopes and binoculars. It will look like a small dot of light moving across a background of stars. - At its fastest, this asteroid moves 1 arc degree across the sky (width of two Moons) in about 1 minute. So technically is not really that fast and gone in a flash. For experience amateur astronomers who had manually tracked much faster satellites manually, this is consider quite slow. Watch the following animation. NOTE: Time in this video has been SPED UP to 50 times faster. So imagine it is 50 times slower than animated and you will have a good feel how fast it is moving across the sky in realtime. - It is predicted to be as bright as magnitude +6.60 which is within the reach of most telescopes and binoculars. The smaller the magnitude number, the brighter the object, the higher the chances of seeing it. - Telescopes with a wide field-of-view are recommended. This will allow the observer to spot the asteroid easier and continue to keep chasing it by keeping in the view. If such telescopes also have a big primary lens or mirror, that will be a bonus as more background stars can be potentially seen which makes the movement of the asteroid across the view even more aesthetically pleasing. - Most handheld binoculars are by design wide-view optical devices. They are also a good choice for hunting this asteroid. - The asteroid is moving from South to North, i.e. not following the normal path of stars across the sky. So tripod mounts with computerised tracking may not be very useful in tracking its path automatically. Manual alta-azimuth mount with smooth slow-motion adjustment is recommended for best visual experience. - This is also a good astrophotographic opportunity. You may try to take a photo of this asteroid through a telescope via prime astrophotography - e.g. attaching the body of the DSLR camera into the back of a telescope. The phone-camera-through-telescope afocal method will not work as the asteroid is too dim to be captured this way. Another method is long-exposure photography with just camera mounted on tripod alone - aim, zoom in and shoot directly at patch of sky where the asteroid will be. How to find its predicted path at a particular observation spot? (1) Use Google Earth to find the exact longitude and latitude information of your observing spot. You may also go there physically beforehand and get the info via your phone GPS software. (2) Go to Heavens Above website. - Register a free account. - Key in this location information in your profile. - Go back to the Heavens Above homepage. - Click on the first link at the top of the webpage to generate a customised sky chart showing the asteroid flyby path at specific time. - You can also click on specific parts of this chart for a zoomed in view. You may screen-capture and print them and bring along for the actual event. - Click on "change" beside Target Body. Search for and change it to "2012 DA14". - Click on the button "Generate Ephemeris"
Now you will see listing of the asteroid path minute by minute and its location in RA Dec celestial co-ordinates format. You may print it out and bring along to the observation site. - Date time display at first column = Add 8 hours to convert to Singapore time. - APmag column = the smaller this number, the brighter the asteroid will be. - Take note of the associated R.A. and DEC numbers. They are like the x and y co-ordinates on a graph. Most planetarium software will allow the user to key in these RA and DEC numbers and then display exactly there this spot is in the sky chart. This is the most important and useful feature for hunting this asteroid accurately. (4) Bring a laptop to the observation spot. If you can get internet access there, you may view the Heavens Above generated chart, generate the JPL HORIZONS data live (step 3), watch the live event streamings and read the latest twitter updates. 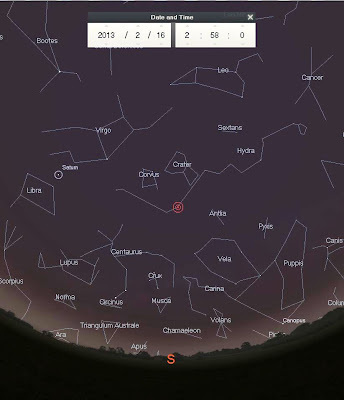 Install these two free planetarium software in the laptop - Stellarium and TUBA. These software does not require an internet connection. (5) With the generated JPL HORIZONS data, use the search RA DEC feature in Stellarium and locate the predicated location on the laptop screen. Then use the other features (e.g. flipping the view left/right or up/down) to match how the starfield should look like through your optical instrument. 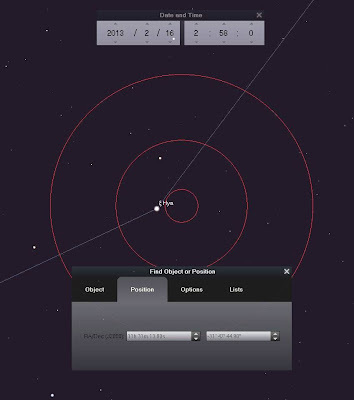 Using Stellarium, press F3 (Search Window), go to Position tab and key in the RA DEC. Using TUBA, click on the Navigation Dialog (globe icon), move the sliders on the RA DEC columns. - User-friendly slider bar to display the dimmest star so you can match the sky condition where you are at closely. This will make asteroid hunting less confusing through the optical instrument. (6) Using the above information, you can try to find checkpoint positions which are easier for your optical instrument to point at beforehand and "ambush" the asteroid! This asteroid location indicated by the center of the inner red ring is very near the magnitude +3.5 bright star ξ Hydra in the constellation of Hydra. So a few minutes before 2:58am at the park, I will point and place at this relatively easy-to-find star in Hydra at the centre of the field-of-view of my telescope. Then just keep looking through the telescope and hope to catching a dimmer moving (!) dot across the view at 2:58am. From then on, manually track the asteroid and let others have a look at it. You may also watch the live streaming of this event via NASA on Ustream and SLOOH. This live streaming can be used to double check the asteroid's location at the observation spot. While hunting for this asteroid, Saturn is a magnificent planet to observe too. So do take a look at it if you have access to a telescope. Let's all pray for clear skies for this rare event! Hope to see you guys at Bishan - Ang Mo Kio Park tomorrow!